I love colour in my quilts but also in my wardrobe and I wear it a lot too. I have bright green trousers that I wear happily to work and an all yellow trouser suit. Colour makes me feel good and brightens up the day. And its no different with my knits. 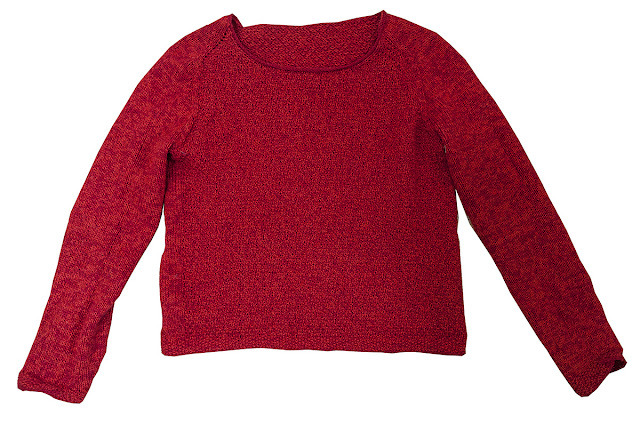 I looked at my wardrobe a while back and thought I need a red jumper. 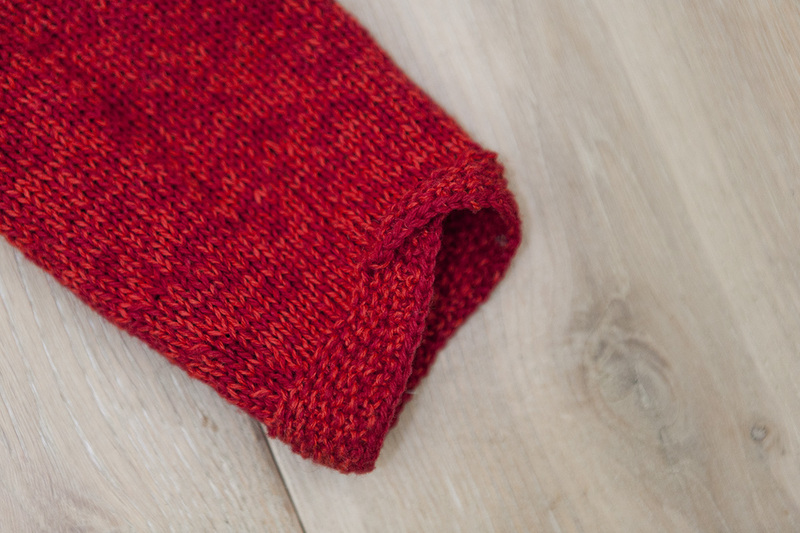 And so I knitted a red jumper. The pattern I chose is again from 'La maison Rililie" and is called "Dessine-moi un mouton". This is the second pattern I have knitted from 'La maison Rililie" after the funky Grandpa cardigan from last year. I love those patterns. They are wonderfully detailed and written with real skill and love to the job. And I have become quite obsessed with top-down knits. This pattern has a wealth of detail and gave me again a chance to learn a few new techniques such as the wonderful finishing at the cuffs. I used "Holst" yarn but not the Supersoft version that is used in the pattern, instead I knitted Coast which is half merino and half cotton as I intend to wear this jumper in Spring and Autumn when it is a little cold but not too cold. The yarn is very thin and runs at 350 meters per 50 gr. 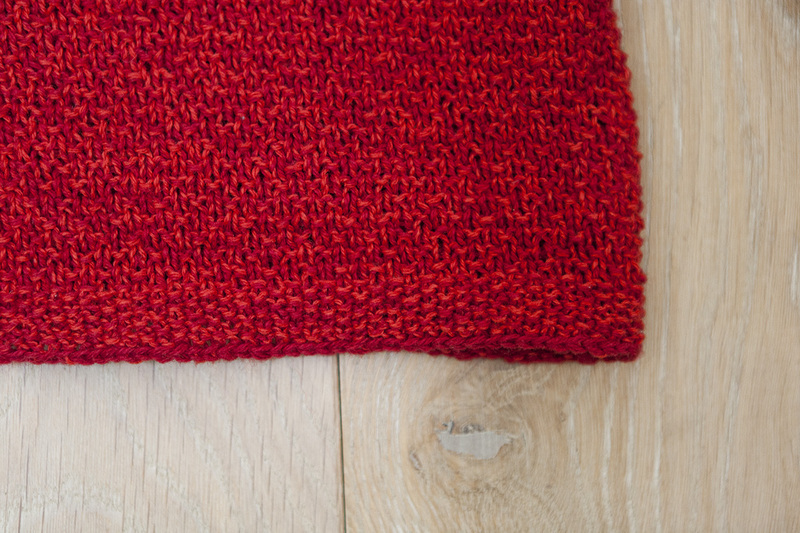 which is why I knitted it double and mixed two different reds to get a light heathered look. The colours I used are "Rosehip" and "Poppy" and both were bought online at Tangled Yarn here in the UK. This yarn is fairly inexpensive and has a lot of fans but I yet have to wash the sweater and am a little apprehensive whether it shrinks. I did knit a swatch and washed it by hand in fairly hot water and I observed no discernible shrinkage. The yarn knitted very well but breaks quite easily. I have worn the sweater several times and it feels very good and soft on the skin. 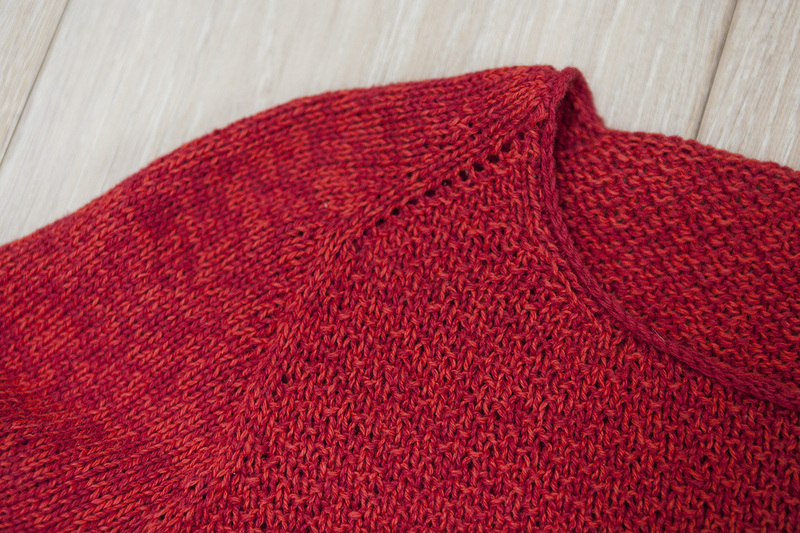 The only other change (apart from the yarn) I made to the pattern, is that I omitted the raw neckline for a more finished refined look.